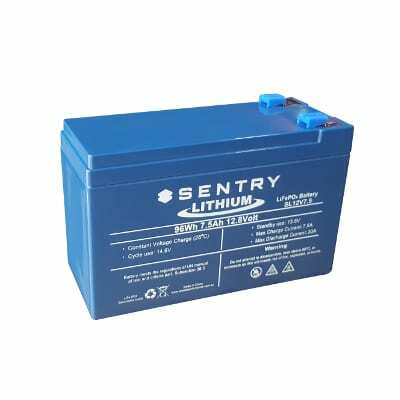 The Sentry Lithium range comes with all the benefits of LiFePO4 composition in either the standard 12V SLA case sizes or the convenient 19″ Rack mount for Telecommunication, UPS and solar applications. * Greater number of cycles (2500+) along with greater utilisation of available capacity (up to 100% DoD) depth of discharge, means up to 8 times the cycle life of standard SLA technology – lowering your total cost of ownership. * Integrated battery management system (BMS) – Provides optimum safety and performance. * Safe and stable chemistry – The use of LiFePO4 along with integrated BMS greatly reduces the risk of combustion or explosion due to high impact, overcharging or short circuit situations. * Higher energy density means Sentry Lithium is close to half the weight of an equivalent SLA making them ideal for mobility and weight critical applications. * Rugged plastic flame retardant case and cover.